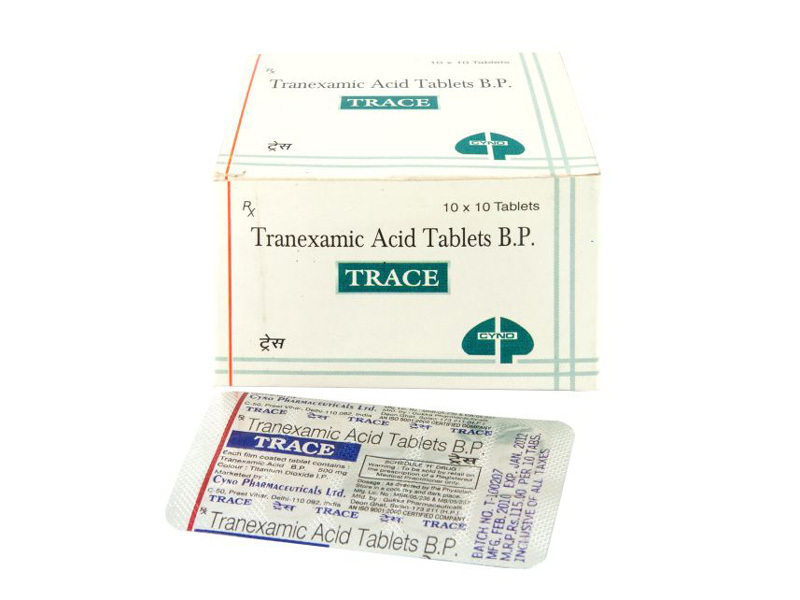 Tranexamic acid exerts antifibrinolytic effect by forming a reversible complex with plasminogen through the lysine binding site of fibrin and thus displaces the plasminogen from the fibrin surface ; preventing the binding of plasmin to fibrinogen or fibrin monomers. It inhibits the activation of plasminogen (i.e. formation of plasmin). It also acts as a weak non competitive inhibitor of plasmin and blocks it`s action on fibrin. Absorption: About 40% is absorbed orally. Distribution: Widely distributed in the body. Excretion: Excreted mainly as unchanged drug. Oral: 3 to 4gm/day in 3 to 4 divided doses or 15 to 25mg/kg body wt. 3 to 4 times daily. I.V. : 1.5 to 3gm/day in 3 divided doses or 10 to 15mg/kg body wt. 3 times daily. Administered as slow I.V. injection or as continuous infusion; at a rate of 25 to 50mg/kg/day. Store below 25 degree C. and protects from light. Keep out of reach of children. Treatment is supportive and symptomatic. Remove drug from the body by induced emesis, gastric lavage and administer activated charcoal to reduce absorption. Maintain adequate diuresis with the aid of fluids and diuretics.